Download the app for best offers! Mail this page to someone you know, or send it to yourself as a reminder. Hey this stuff happens, send us your email and we'll reset it for you! Wait, I remember it now! Property Location When you stay at Prince Solms Inn B&B in New Braunfels, you&apos;ll be in the suburbs and convenient to Schlitterbahn Waterpark and Christus Santa Rosa Hospital New Braunfels. 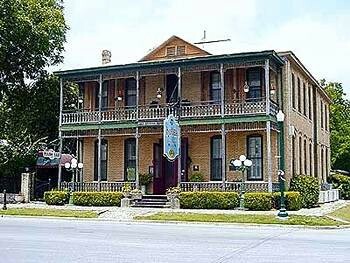 This bed & breakfast is within close proximity of Landa Park and New Braunfels MarketPlace.Rooms Make yourself at home in one of the 14 air-conditioned guestrooms. Cable television is provided for your entertainment. Conveniences include phones and ceiling fans.Dining Quench your thirst with your favorite drink at a bar/lounge. A complimentary continental breakfast is included. Book hotels with instant confirmation, HD photos,verified reviews, Google maps, multiple payment options,and lots more!